Hey everybody, I thought I would post this up here now. I have this posted on Expeditionportal.com also. Every Friday night we have a campfire up in the Tortolita Mtns in Cochie Canyon. It is near Dove Mountain. We have been doing this for about a month and a half now and it has been pretty successful, there is pretty much always someone out there to hang out with. We just meet up in the same spot every Friday night usually starting around 5 or 6pm and just hang out around the campfire and converse. Anyone is welcome to come. This is usually a pretty mellow, relaxing gathering and a good way to wind down after a week of work. If you get there early enough it is also an amazing place to watch the sunset. Enter through the powerline on Tangerine in between Dove Mountain and I-10 (2.46 miles east from I-10, 2.46 miles west from Dove Mountain Blvd.) Head north through the gate and follow the road about 1/4 mile. The road will veer left about 45° and begin heading NW continueing to follow the powerline. From the gate you will travel 2.3 miles. When you come to the powerpole marked #35 you will turn right up the wash(powerpole will be on your left). Follow that wash into Cochie Canyon 2.7 miles north to the spot. The spot is the 1st large rocky outcropping you will come to. You should be able to make it out in 2wd but I would recommend having 4wd to be safe as sometime the sand can be soft. 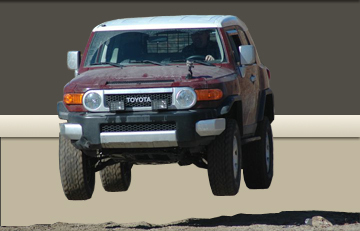 I dont drive an FJ, I just like to smash them up! This is how my Friday night gig began 10 years ago!!! "You can call me ShamWow, cause you'll be saying wow every time"
Yep, got it done yesterday, along with replacing the battery that went bad on Sunday and the intake tube that cracked when I lifted the motor up trying to get the new mount in there. Are you making 10 dollars a night yet? I don't know if anyone is heading out there tonight, if so, I'm on my way out the door now. Hopefully I will see someone there! Very cool to see something local... I can't make it this coming week, but I'll be there in a couple for sure to check it out. Thanks for posting. Tim - I couldnt make last weeks campfire, but if you're planning something this friday (11/4), I'd like to join you. We should be there, bring firewood it may be a bit chilly. I'll be there this week. I have only missed one so far, my plan is to be there nearly every week!